Berger des Pyrénées - Berger Picards "de la Vallée du Mouton"
This is the most important dog show for pyrenean shepherd dogs worldwide and this year have been entered 165 pyrenean shepherd dogs, they were judged by 3 french judges. The most succesfull dog of our kennel was "CH. Furette de la Vallée du Mouton" who was Veteran winner, one year after her mother "CH. Tavelle Bleue de la Vallée du Mouton" won this title. "Houchette de la Vallée du Mouton" (owner Ariane Faucillon) won 1st place in Agility-championship in niveau I. The biggest international dog show in world was held in the capitol of the Netherlands, Amsterdam and there was also a second international dog show, the Benelux Winner show at august 9th. Best puppy at both days, our "Tiara Bleue de la Vallée du Mouton"
Best male at both days and World winner again, our "CH. Kalix de la Vallée du Mouton"
(he was also World winner in 2015 and 2017). The world winner show is every year a special event. The best male and the best female of each breed can win the title "Worldwinner" and the best young male and best young female can win the titel "World Young winner". 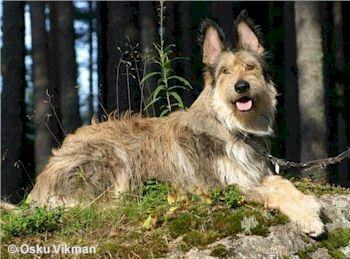 Dogs from our kennel won several times world-winner titles, the first was "Avalon de la Vallée du Mouton" from our very first Pyrenean shepherd-litter.